Since the upset election of Donald Trump, the Left's very public meltdown continues to have them outing themselves as, well, the poorest sports to be kind. What else that has been revealed post-election and continues to be confirmed on a daily basis is that the Democratic Party, the MSM, Hollywood and at the very least, one of our famed intelligence agencies i.e., the FBI, all work in lockstep. And they accuse Trump of collusion and fascism! Of course, we who were awake knew this before the election, but the Left always denied it trying to portray themselves, the Party of KKK, abortion on demand and gay marriage, as moderate. Now it's more and more in the open; they are raging fascists and anti-American socialists who will stop at nothing to get their power back and shut up opposition by shutting down free speech. What pray tell is more fascist than a federal "law enforcement"/spy agency seeking to undermine and impeach a sitting President, not to mention influence a Presidential election, using fraudulent documents (the so-called 'dirty dossier') created by an opposition party and given free cover to the crime and cover-up from our nation's declared "free press"? But I digress. 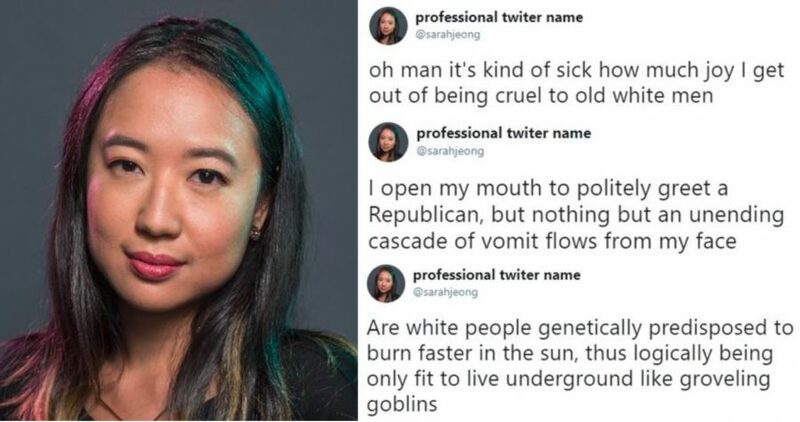 What we have here is proof positive that one of the "Elites" of the MSM, that old "gray lady" the NY Times are themselves now openly racist. -W.E.